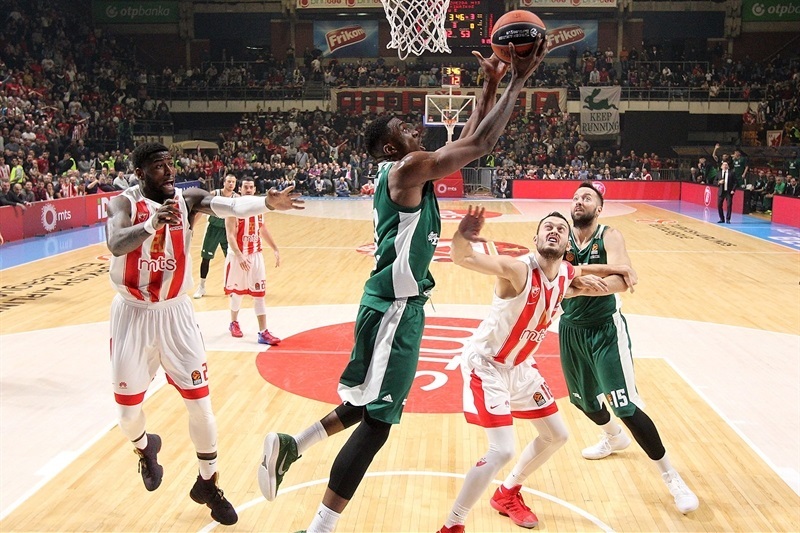 Panathinaikos Superfoods Athens held on for a tough 63-69 victory over Crvena Zvezda mts Belgrade on Thursday at the famed Aleksandar Nikolic Hall in the Serbian capital. 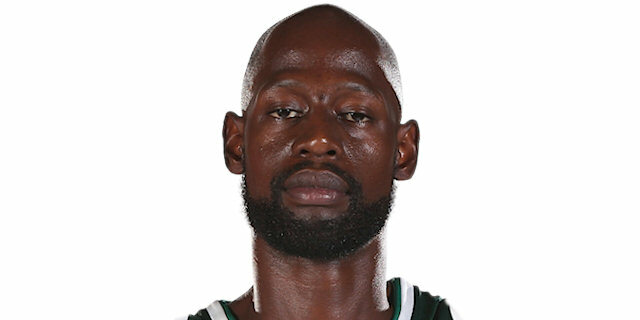 The Greens racked up their eighth win in nine games to improve to 10-4 and keep at least in a share of third place in the standings through 14 rounds. 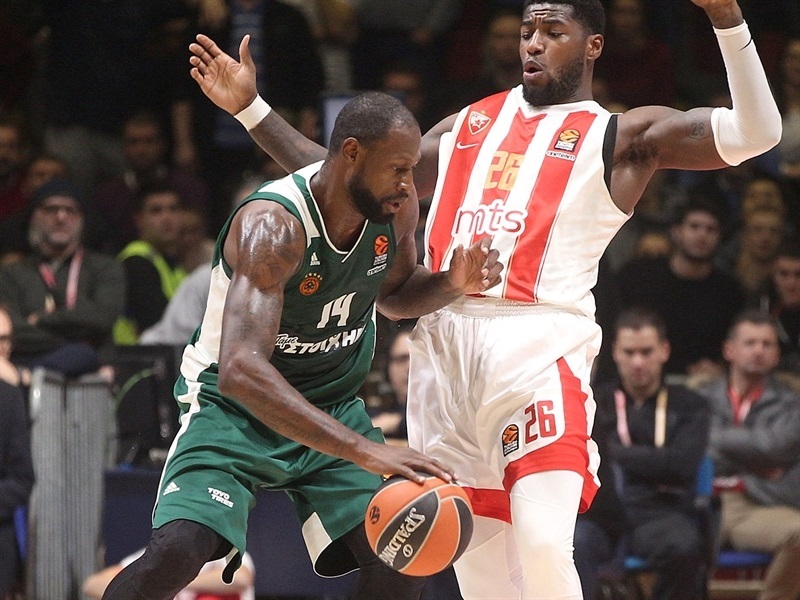 Playing without star point guard Nick Calathes, Panathinaikos committed 15 turnovers, but excelled on defense and limited the Serbian champs to sub-par shooting. James Gist and Marcus Denmon scored 16 points apiece to pace the winners. 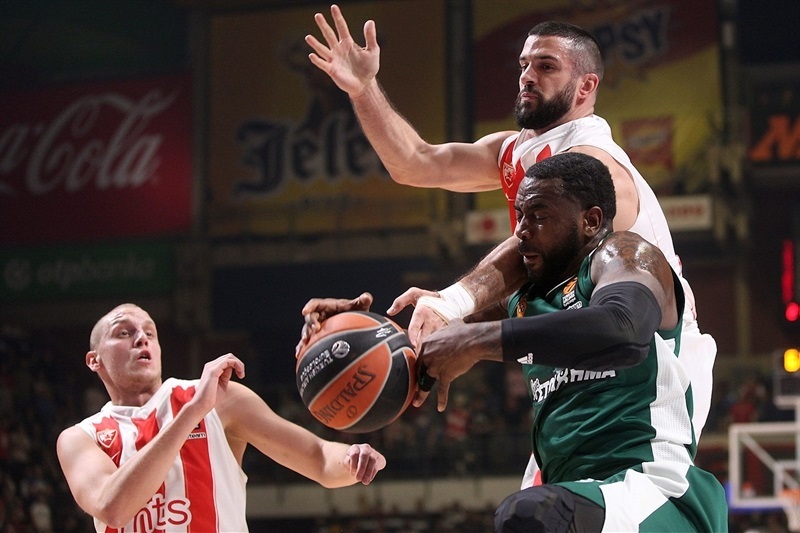 Former Panathinaikos swingman James Feldeine led Zvezda with 21 points in defeat. Both teams scored on their first few possessions and the score was even after Taylor Rochestie’s three-pointer, 7-7, after three minutes. Gist, who had already dunked twice, added a triple before Chris Singleton did the same as the visitors took charge. 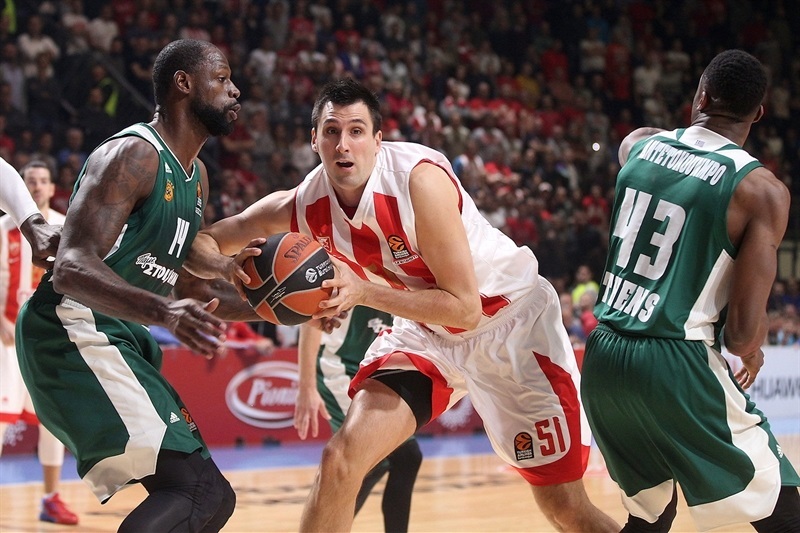 However Zvezda responded with four players scoring on an 8-0 run to regain the lead. 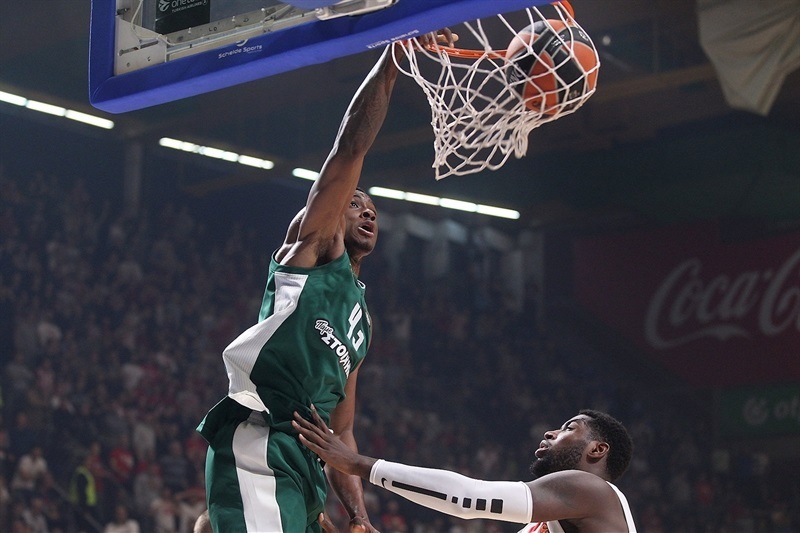 Then the Greens reeled off 7 unanswered points – the last 3 of which came courtesy of a basket-plus-foul by Gist – to lead 15-20 after 10 minutes. 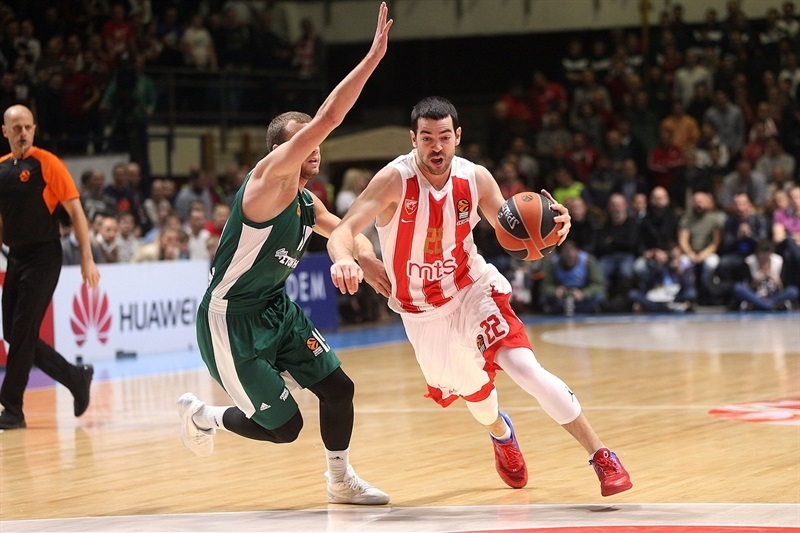 Feldeine scored 6 points – including a go-ahead three-pointer – in an 8-0 Zvezda run that made it 23-22. 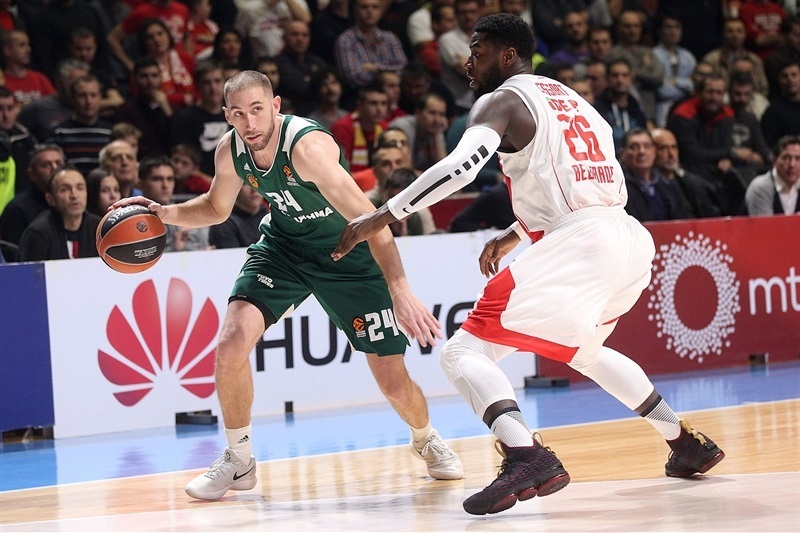 The lead changed hands as Ognjen Dobric and Matt Lojeski swapped threes, but a late 8-0 Zvezda push in which Milko Bjelica scored 5 gave the hosts a 38-34 edge. Gist tied it with a put-back and Denmon hit a three on the halftime buzzer to make it 38-41 at the break. 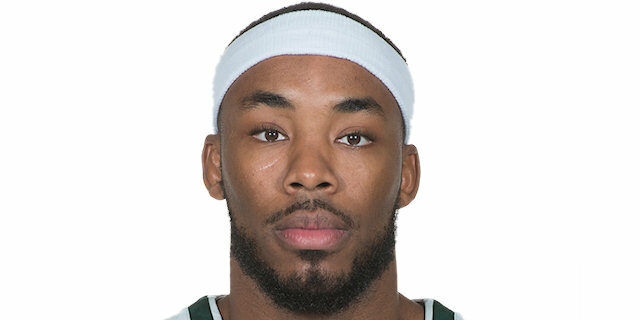 A Thanasis Antetokounmpo put-back and layup and a Denmon floater highlighted a 0-11 run for the Greens that made it 42-55 midway through the third quarter. 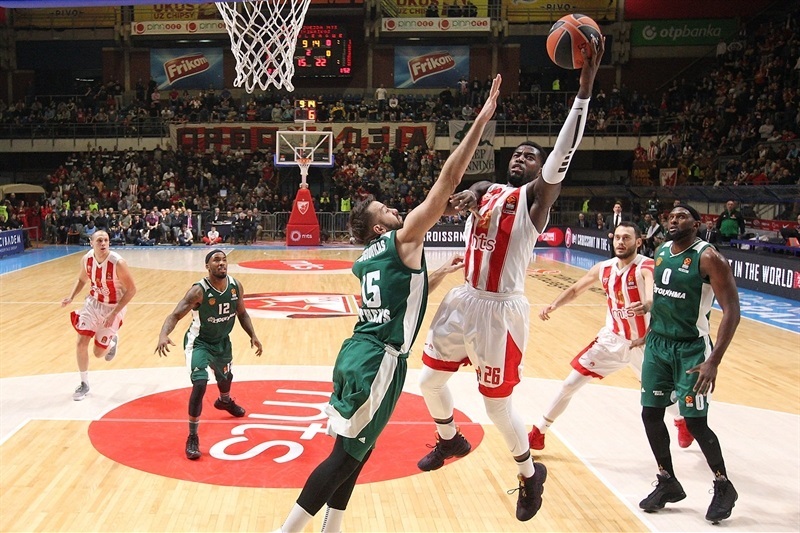 The Panathinaikos defense held Zvezda scoreless for more than five minutes before Feldeine ended the drought with a steal and layup. Stefan Jankovic drilled a three and Mathias Lessort a tip-in to get the crowd involved again at 49-58 through three quarters. Dobric’s reverse layup and Jankovic free throws drew the hosts within 5. 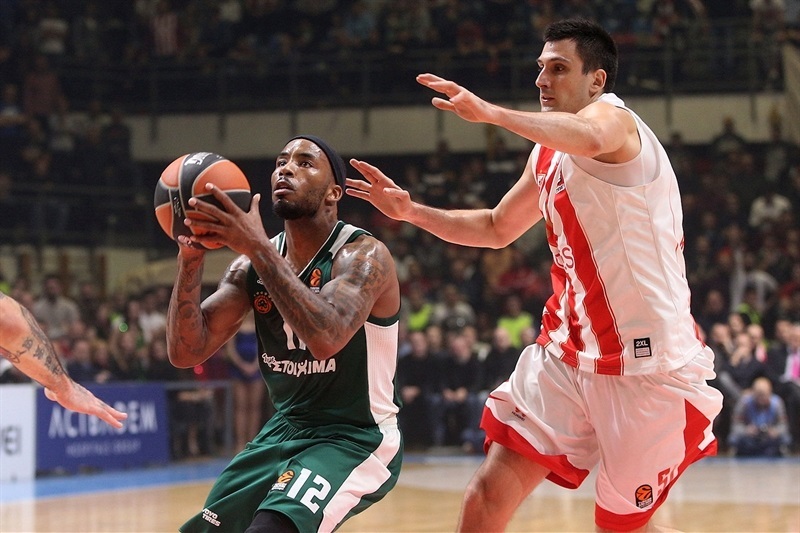 Kenny Gabriel quieted the hall with a three-pointer and Gist’s layup for a 55-64 advantage prompted a Zvezda timeout. 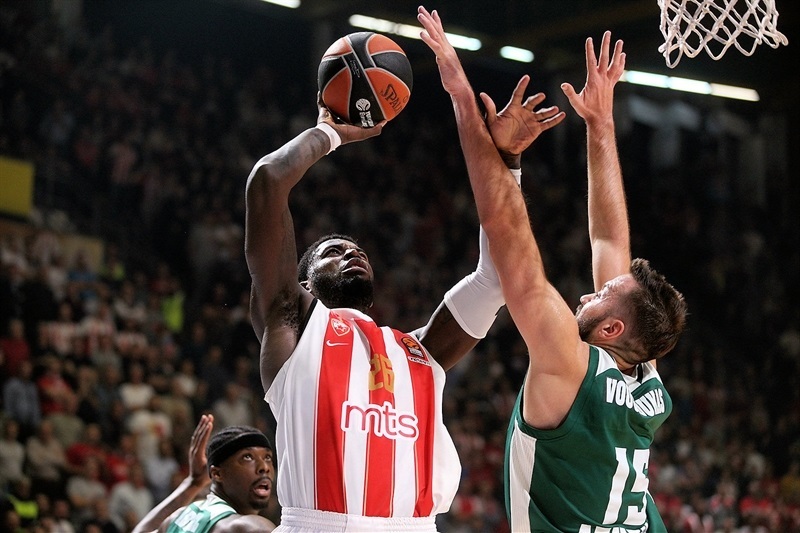 The hosts refused to cave in and after a Branko Lazic triple and Feldeine free throws, it was a one-possession game, 63-66, inside of two minutes. However Zvezda was held without points the rest of the way as the visitors held on for a gritty win. "Tonight we had a great chance to compare ourselves with a good team, which is ranked among the top four teams in the league. Unfortunately we didn’t have enough energy to play like we know. We could definitely see that our recent travels, four games in seven days, left their mark. Several times we played good defense, but lost concentration in the last 4 or 5 seconds on defense, which they turned into baskets right away. But I cannot blame my players. We fought as much as we could at this particular moment. This team brought itself into this abnormal situation, where people expect it is normal that we keep winning in the EuroLeague in streaks. We had a great series of victories and we will try to make another one. We believe in the things we do, I feel it shows that we keep improving and growing. 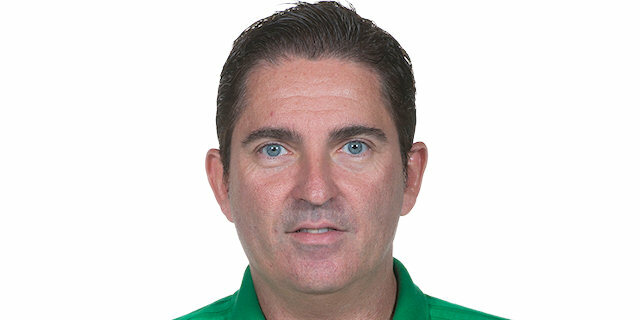 I believe we made Panathinaikos look bad on offense in the second half, as much as they made us look bad in the second half, too." " It was a very tough game. We were sure of that before we came here. In the second half I think we played better defense. We didn’t play so well in offense and made some turnovers when we had the possibility to finish the game. 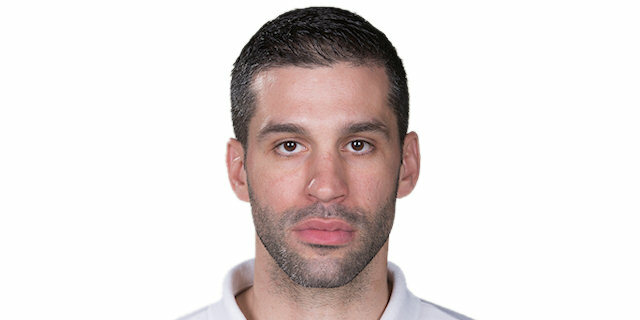 After that Red Star came back and scored three-pointers and changed the game. I think it was very important at this moment that we were 9 points up and we made a mistake with 1 second left on the [shot clock], but we kept calm and controlled the game and this is why we won this game. [The third quarter] was very important because we found the rhythm. We were close to 11 points, I think, up and we got confidence from that." "We set a goal this week to be able to go on the road and try to get us a win in a tough environment. Even though we had some guys missing, we were able to come out and find a way to get a win. This is a very tough place to play, and we understood that. Each game we are starting to learn more about each other, and we are getting better each week. That’s all we can ask for, taking it one game at the time. And I want to congratulate the guys on this victory." "It’s always huge to come here and win in a place like this. Red Star has a really good fan base and Belgrade is always a tough place to play. We stuck together for 40 minutes and that was the most important thing for us. You just gotta be able to step up. We are professionals. This is the time of the year when we can decide whether we’re going to have a good season or if things are going to go down. Right now we’re showing good characteristics. Everybody played hard, everybody stuck together and that’s what we’re here to do."